The next day we hired a fishing boat (and its captain) to take us sailing to the nearby sights. Another family, whose kids had become friendly with Daniel and Eitan, decided to join us. Directly opposite the resort in the sea is a small island, known locally as Monkey Island. We anchored and waded ashore onto a tiny beach. The captain then whistled a few times, and within a few minutes monkeys started running along the beach and straight up to us. These monkeys see visitors daily, and the captain had brought along a few bunches of bananas for us to feed the monkeys with. 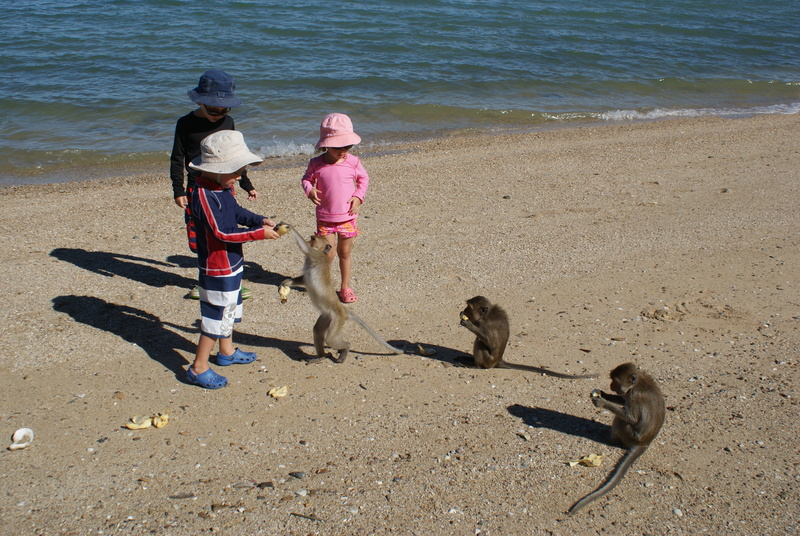 These monkeys were not aggressive at all, and the kids felt very comfortable around them. When the bananas were all done, we went back to the boat to continue our exploring. We made our way towards the National Park, and anchored just offshore where the captain now produced some fishing rods and bait! 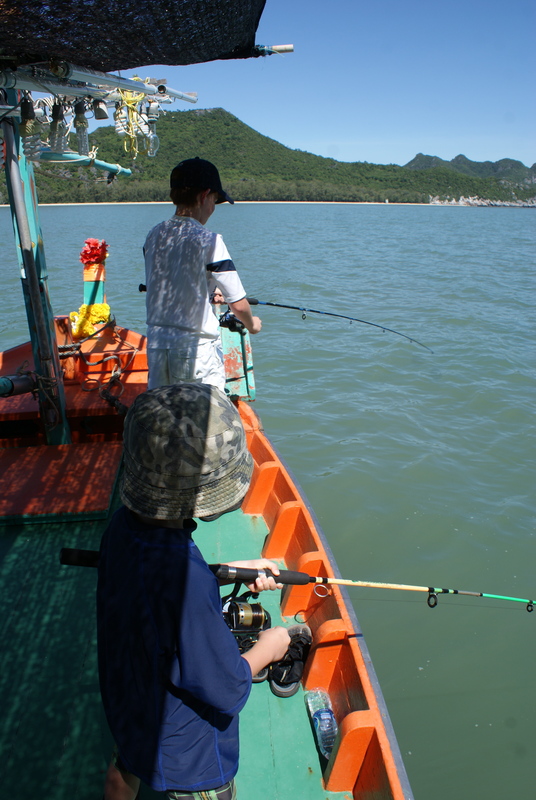 We are not experienced fishermen – we’ve caught a few fish out of a pond before, but the kids found it very exciting. Alas, there were no bites, so after about half an hour later we anchored off the pristine white sand beach of the National Park. 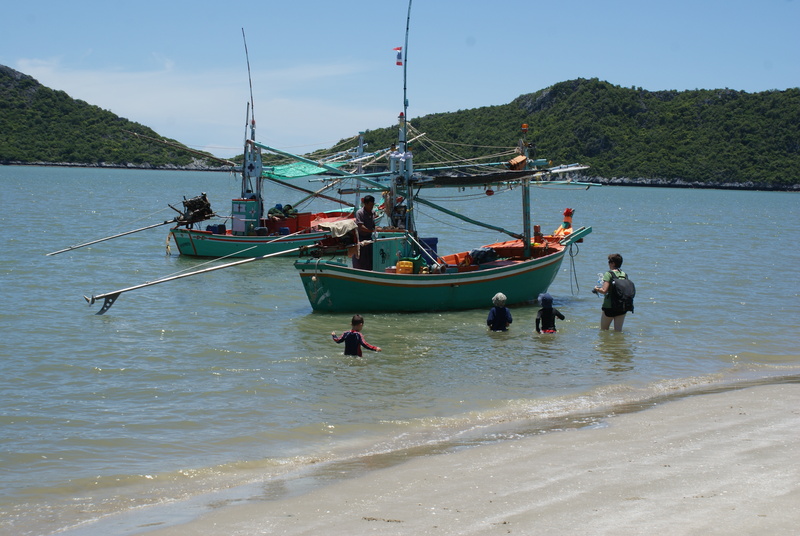 Sam Roi Yot was the first coastal national park established in Thailand. People come for the rich bird life, the beaches and the caves. It’s history is interesting and somewhat tragic. The Thai King Mongkut , together with many European guests, came here in 1868 to observe an eclipse of the sun. This they did, but the king managed to be bitten by a mosquito, contracted malaria, and died soon after. Since then, Thai kings have been making regular pilgrimages here, and in 1890 a pavilion was built within the largest cave in honor of the kings’ visits. We hiked up to the cave – it takes about an hour and is uphill, but the kids managed just great. The caves are huge, and have collapsed roofs, meaning that the sun streams in. We explored and then it was a quick hike down the hill to the beach. If it were up to me we would have stayed a while at what was really an incredible beach, but the kids wanted to get back on the boat and go back to the resort, which we did. The rest of our time at the resort sped by. We really did very little – we enjoyed the massages, the great food, the pool and the sea. Finally, the time came for our 3 hour taxi ride back to Bangkok Airport, for our flight back home. (PS I am now planning great family trips to Thailand and South East Asia. Click here for details). « Thailand with Kids. Dolphin Bay – A beach paradise.